The Ala Augusta continued at Old Carlisle, as we learn from inscriptions from A.D. 188 to A.D. 242. 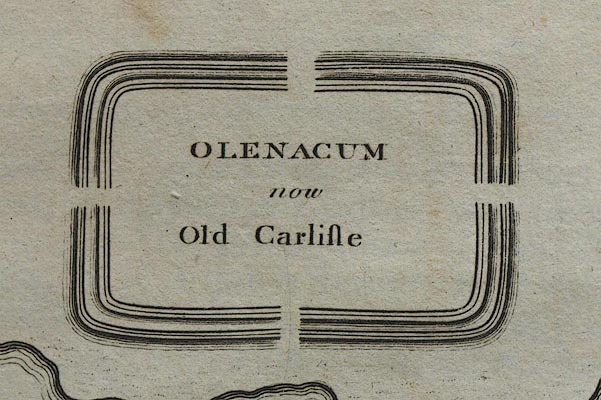 The Notitia at Olenacum seems to call it Ala Herculea. A military way has gone from the wall southward from Old Carlisle to Elenborough. The ruins of the Roman town and station are very grand and conspicuous on a large and visible military way leading directly to Carlisle and the wall, and there is no other station on the wall between it and Carlisle. There seems to have been a double rampart round it. The river Wiza runs about half a mile from the south and west side, and from the west is a fine prospect to the sea. The first of Mr. Camden;'s inscriptions is now in the west wall of the garden at Drumburgh. Mr. Gale in Phil. Trans. No.357, reads the first word of the 5th line LING. N. quasi Lingonensis for the name of the province or place whence Tiberius or Justinus came. Another found here belonging to the same ala has been mentioned at Elenborough, and is Horsley's lvii. The next may have been on a defaced altar in the hayloft at Drumburgh. The third was brought away by sir Robert Cotton to Connington, and is now at Trinity college Cambridge. The letters rude and uneven. The Ala is here called Gordiana, the date A.D. 242, under the reign of Gordian III. The altars at Wigton are probably gone. The milliary was in Horsley's time at Naworth castle, now at Rookby. The other two are now lost, but the second of them may be a dedication to Ocean, as Ward, or to Mars, and Mercury, and the next two may be effaced from two altars now at Drumburgh. The other articles mentioned by Mr. Camden I take to be Lares. Two more inscriptions found here are copied from Gent. Mag. May 1757. XXVII. p.220. Old Carlisle is in the parish of Westward. This was likewise copied for me by that most learned minister Oswald Dikes, now preserved in his brother T. Dike's house at Wardal. besides great numbers of small images, statues on horses, eagles, lions, Ganimedes, and many other evidences of antiquity continually coming to light. The roman name belongs elsewhere. Map of roman roads through Britain, scale about 55 miles to 1 inch, derived from the Antonine Itineraries, plotted by William Stukeley, 1723, published London, 1724. Probably the roman fort at Old Carlisle, Cumberland. NB: Horsley's ideas are not all accepted today.